We at Paint Coatings Plus pride ourselves on a strong tradition of providing top-notch services and 100% customer satisfaction on any job, big or small. Serving the Front Range, we have established a reputation as a competent and trustworthy company. All our handymen are licensed, insured, experienced, and most importantly, hand-picked to assure the highest standard of quality. So whether you need help with a few broken cupboards or an entire home tune-up, trust Paint Coatings Plus for prompt, courteous and affordable service. Call us today for a free estimate! Your home is your biggest investment. We specialize in residential and commercial painting for over 10 years. Let our professionals make your home or business look brand new. Whether you need a small one room makeover or a complete remodel, Prism can make that dream come true. We take pride in our services and affordable quality. Please call us today for your free estimate. When remodeling your bathroom, the first step, and the most important, is choosing a contractor you can trust. Many companies perform substandard work, overcharge, change their names frequently to stay under the radar, or all of the above. At Prism Coatings Plus, our commitment is to set the standard for quality of craft and service in all projects, big or small. Whether you’re looking for a sleek modern look, something more traditional and elegant, or anything in between, we have the experience and advanced training to get the job done right the first time. At Paint Coatings Plus, we are dedicated to providing best-in-class bathroom remodeling service at affordable prices. Our experience and relationships with manufacturers allow us to offer these services at unbeatable rates. So when you need affordable, top-quality service you can count on, count on us. Do you have an unfinished basement, just waiting for a purpose? We can help! When renovating your basement, the first step, and the most important, is choosing a contractor you can trust. Many companies perform subpar work, overcharge, change their names frequently to stay under the radar, or all of the above. At Paint Coatings Plus, our commitment is to set the standard for quality of craft and service in all projects, big or small. Whether you’re looking for a sleek modern look, something more traditional and elegant, or anything in between, we have the experience and advanced training to get the job done right the first time. 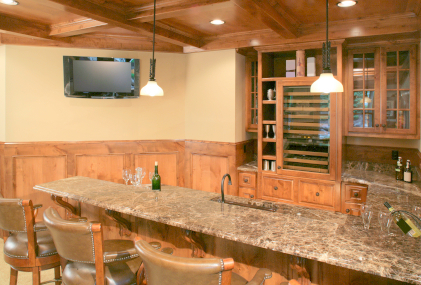 We are a full-service basement remodeler, and that means that we have brought together expertise across several disciplines, including plumbing, electrical work, lighting and construction, to create a cost effective and efficient process for unparalleled basement renovations. We can make your space exactly what you need – a guest suite, a play room for the kids, a game room or a TV room. At Paint Coatings Plus, we are dedicated to providing best-in-class basement remodeling service at affordable prices. Our years of experience and unparalleled work ethic allow us to offer our services at unbeatable rates. So when you need affordable, top-quality service you can count on, count on us. You might think that the living room is the most “lived in” room in your house, but it’s usually the kitchen! Whether you’d like to maximize your space, build an island or add a sleek, modern touch to your kitchen, our highly-experienced contractors will help you along every step of the way. Kitchen remodeling is no small decision, so we’re more than happy to answer any and all of your questions to help you feel comfortable with yours. Whether you’re building a new home or merely fixing up an old one, a good carpenter is essential to any serious home improvement project. At Paint Coatings Plus, we’re serious about carpentry. 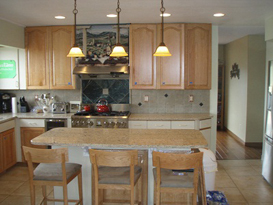 Paint Coatings Plus is comprised of a group of dedicated artisans and craftsman that specialize in fine carpentry. We love working with wood and our relationship with the craft is a passion first and business second. In addition Paint Coatings Plus is available for any custom carpentry projects you may have. Our carpenters will work with you every step of the way to insure that your new piece of carpentry work looks just as you envisioned it would. Paint Coatings Plus is fully licensed and insured and our service is prompt and efficient. We offer free estimates and are available for advice on prospective carpentry work. When you receive a quote from Prism Coatings Plus, that quote will be the price you’ll pay and we’ll never tack on any hidden fees or extras mid-job. Get started on your new carpentry project with the help of Paint Coatings Plus. Call us today for a free estimate. Whether you need a new door put in or just a simple repair job on an existing door track, Prism Coatings Plus has the qualified experts to help you along every step of the way. From design consultation to installation, our contractors are there to give you quality assurance. Serving the Denver Front Range, Paint Coatings Plus is proudly committed to providing our clients with comprehensive residential and commercial drywall services. We are a full service drywall company with broad experience in drywall installation and repair, and we take care of every phase of drywall installation, from consultation to finishing and texturing. Each member of our staff is hand-picked for expertise, competence and courtesy, and we are fully licensed and insured. So whether you have a specific blueprint in mind or would like to take advantage of our free design consultations, we have the expertise and training to ensure that your project is completed on time, within budget and to your full satisfaction. For more information or to schedule a free consultation, please call Paint Coatings Plus today. Specializing in window installation and repair, Prism Coatings Plus has been providing quality service on all major and minor window projects in the Denver Front Range for years. With experience ranging from storm and security window installation to complex wood window repair, our licensed and insured contractors are available today for a free estimate, so call now to get expert consultation tailored to your needs and budget. Adding new windows is one of the easiest ways to improve the look and feel of your residence while reducing your heat loss and energy bill. But the quality of window installation and repair service varies widely from business to business, and hiring the wrong contractor can lead to shoddy workmanship that can cause water damage or even rot. Whether you need repair/installation service for a small residential window to an entire building, trust the experts at Prism Coatings Plus, the one-stop resource center for all your window needs.